2016-06-22 Well, our 2016 ARRL Field Day adventure has been aborted. One key player is on an Alaskan cruise and the other man let me know this morning that he too will not be able to participate. And since I really don't care to do it alone, that's it! But preparing has been fun. On the antenna front, after playing with my 40 meter doublet and both a 51ft and 35 ft end fed wire I decided to put my G5RV Jr up again and compare. The result? The 51 ft G5RVjr is by far the best antenna, if received signal strength is any indicator. And I seem able to make contacts much easier with it than with any of the others. So had we proceeded, that would be my antenna of choice. Rig Wise, last night I put together my transmitter, tuner and battery package. It consists of my Yaesu FT-817nd, LDG Z11-Pro II auto tuner, old J38 style key and mic. The battery power is provided by 8 AAA 1900mAh eneloop cells in the radio plus a 7Ah sealed lead acid battery. If needed I have several three cell 3200mAh lipo batteries that I normally use in my RC planes. The LDG tuner requires a very small amount of power to operate. When running off an external battery I'll just tie it to that source along with the radio. If I need to use the internal radio batteries I'll simply use a small 3 cell lipo battery to power the tuner. I've had several QSOs the past couple of days with this setup and am confident it can do the job. Perhaps this is my SOTA/portable station, should I ever get around to using it as such! I've spent most of my ham life imagining portable, remote operation but have yet to actually do much of it! 2016-06-14 After playing with the 51 ft end fed and 40 meter doublet the last few days I decided I wanted to try the 35 foot end fed. So I took the 51 footer down and discovered what I had forgotten, that I had made the 51 ft one by simply adding an extra 16 ft to my original 35 footer! And with a connector no less. So I decided to simply modify that one by inserting an insulator between the two sections with a connector so to go from a 35ft to a 51 foot or vice versa I simply had to lower the antenna and either plug or unplug the connector. ​But what to use for an insulator? I wanted it to be very light weight and very small yet strong enough to handle the tension the antenna would experience when strung in a tree. Looking around in my garage I noticed the plastic tab that holds two small propane gas bottles together when you buy them in pairs. Gas Bottle Clip used as an insulator. It is made of nylon or some strong, flexible plastic about 1/16th inch thick. So I removed a 1/4 by 2 inch piece from its center section after drilling four holes, two in each end for each leg of the antenna. Then I looped each leg through its respective holes and put the male connector on one end and the female on the other. The friction of the wire threaded trough the holes carries the tension. After stringing the antenna up again I got on the air and made one 20 mtr and one 40 mtr contact, both SSB. Tonight I have been comparing the 35 foot antenna with the 40 meter doublet and a full sized G5RV. All tune well using the Tuna Tunah II on just about every band, including 80 meters. Comparing received signal strength there seems to be at about 1 S unit lower signal on the 35 foot antenna. I've been disappointed that I haven't made any contacts tonight but that applies to ALL of my antennas. I think the band noise is just too high for 5 watts tonight. But the two contacts earlier today were encouraging. From my experience last year, during Field Day everyone is hungry for contacts and all of us are using compromised setups so it is easier to make contacts. Overall I am encouraged. 2016-06-01 I'm pretty pleased with the 40 meter doublet. Yesterday I had three good QSOs with it on 40 meters. Still need to play with it on other bands to get a real feel for it but with band conditions NOT being very good, any QSO is a good one. I also need to play with the 51 foot end fed to get a sense of its performance. Field Day is rapidly approaching so time to get serious. Perhaps most encouraging is that my CW has not degraded much. I've not been very active for quite a while so was concerned I might be getting rusty! I've also been watching some YouTube videos of guys activating mountain summits under the SOTA (Summits On The Air) program. Fascinating. KD8RTT has one that demonstrates what that is all about and how simple it "seems" to be to do in his video My First SOTA Activation - W2/WE-094. Not sure if there are any summits in my area but it looks like fun as it potentially combines hiking, camping and radio all in one activity. 2016-05-30 Several days ago I saw a YouTube video of KD8RTT making a 40 meter doublet from speaker wire. So after doing some RC flying this morning I decided to try it out. Digging among my collection of antennas and other junk I ran across an old 40/20 meter fan dipole I had made up some years ago using #16 speaker wire for the radiating elements. Rather than buying more wire I scavenged the 40 meter elements from that antenna. 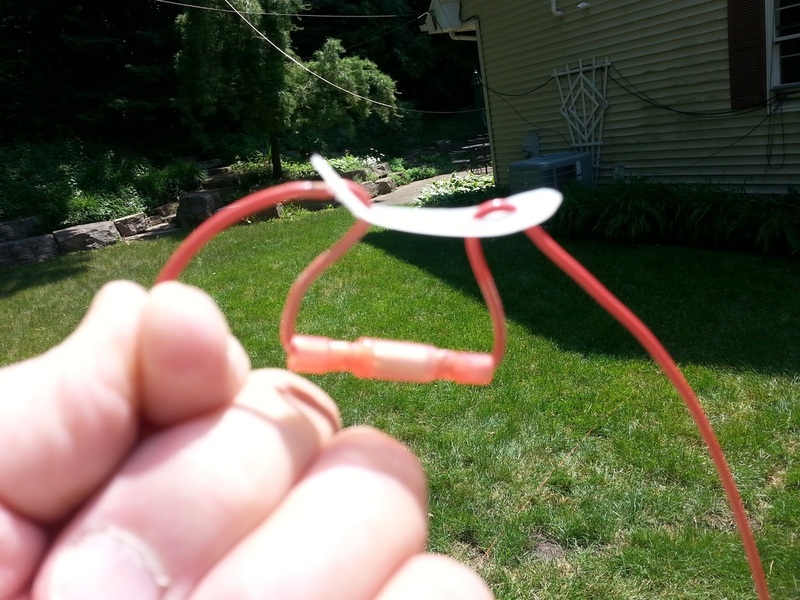 Then I discovered a partial role of #16 antenna wire which had about 30 feet on it. So using a makeshift center insulator made from blue Pex tubing, I put it all together and pulled it up into the trees behind the house. My main antenna tuner in the shack is an LDG Z11 Pro II which came with a "free" 4 to 1 balance to unbalanced balun. So I connected the feedline to that and in turn to my FT-817nd in the shack with a section of coax I had lying around. It works! It tunes up nicely on 40, 30 & 20 meters (I didn't check others) using my Tuna Tunah II tuner. Band conditions were not good at all today so I didn't make any contacts with it but I'm confident it will work. So now I have at least two pretty light weight Field day antenna options in addition to a G5RV Jr. Thanks KD8RTT for the idea! I don't know that I have ever built a doublet of any kind before! 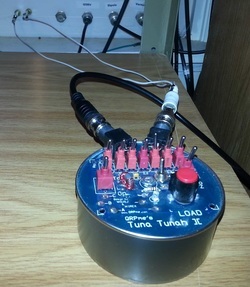 Tuna Tunah II tuner connecting 51 ft end-fed to a FT-817nd. 2016-05-28 This afternoon, after a good morning at church and a nice lunch I decided to find the 51 ft. end fed antenna I used last Field Day. It took me a while but I found it! It was all rolled up along with its counterpoise in a plastic bag along with some feed-line and other bits and pieces. My shack has some brass bolts that go through a 4 inch board in my window, along with a number of coax connectors to make it easy to play with various antennas. I had a piece of rope over a high branch in a tree in my back yard, also specifically to use to play with various antennas. Fortunately the rope was still good enough to pull a new rope over the limb before it broke. And with the new rope I pulled the far end of the antenna up into the tree and attached the counterpoise wire. Both pieces of wire have alligator clips on them to make them easy to connect. So about an hour after starting my search I was ready to see if I could tune it up. My Yaesu FT-817nd is set up in the ham shack so I can use it for all bands with any of several antennas. 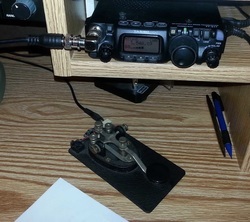 So I ran a coax with BNC connectors from the front antenna connector on the radio to my Tuna Tunah II sitting on the model airplane bench next to my radio table. It took a few minutes to find the tuner switch settings for each band but I was able to get a very low SWR an full output power on 80, 40, 30 and 20 meters. I didn't try the higher frequency bands. Of course it had to be a CQ magazine contest weekend so I couldn't get a "word" in edgewise, but I did manage a short QSO on 30 meters with a station in New Jersey. QSB was really bad but it was a QSO! So, I'm encouraged. I clearly have one reasonable antenna option that I can just grab and go with! FT-817nd and key with coax to Tuna Tunah II tuner going from front connector. 2016-05-21 The ARRL Amateur Radio Field Day for 2016 will be here in just over a month. It is a 24 hour time period from roughly noon on Saturday June 25th through noon Sunday on June 26th when the largest number of radio amateurs or "hams" as we refer to each other will be setting up temporary stations in abnormal locations, powered by generators or batteries with makeshift antennas to see how many contacts (exchanges of basic identifying information by radio) as possible. Some do it from their back yard all by themselves. Others gather with a club of which they are a part and set up pretty elaborate installations in parks or other private or public areas. Some use the least amount of power and the most basic antennas possible to make the challenge even more focused on operating skills. Others use the most power and most expensive antennas they can afford and "blast" their way onto the ham bands. But interestingly it all works together because the big gun with the big antenna is probably the one most likely to hear the minute signal from the "little guy" making them both winners! Some spend the entire weekend banging away on a "telegraph key" and listening intently on headphones. Others use the most recent digital modes using their laptop computers to exchange the information not all that different from "texting" or instant messaging on your phone or computer. 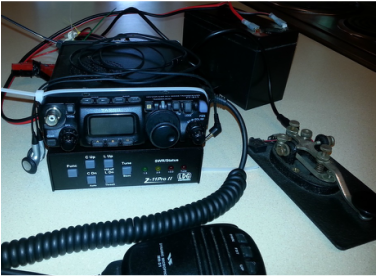 This wide variety of equipment, settings and modes is what makes ham radio so much fun. The options are endless. And "winning" is really all about making contacts using whatever approach you decided to go with. More contacts are "better" but any contact is a success!